If your teeth have been feeling more sensitive lately due to the cold air outside, you’re not alone. Approximately 40 million people in the United States experience tooth sensitivity, according to the Academy of General Dentistry. So, what causes sensitive teeth? Believe it or not, cold temperatures can add to your tooth sensitivity. Protect your teeth and ease your pain by taking a few precautionary measures. If you plan to spend substantial time outside, keep a thermos of your favorite hot drink on hand and take frequent drinks to warm your body. Caffeine-free hot tea is great for warming your body and helping you meet your daily water requirement. Wearing a scarf over your mouth filters the air and warms it up before hitting your mouth. Breathing through your nose rather than your mouth can help eliminate some of the air from hitting your teeth and make you more comfortable. In addition to taking precautionary measures in the winter time, there are several steps you can take year-round to treat tooth sensitivity. Use Toothpaste Formulated for Sensitivity. Some people’s teeth are just more sensitive to regular toothpaste. Try using a toothpaste designed for sensitive teeth. Your Dental365 dentist will be able to recommend a toothpaste that is right for your specific needs. Wear a Night Guard. If you grind your teeth at night, a custom night guard will protect your teeth during your sleep. Avoid Acidic Beverages. 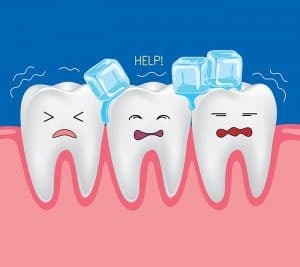 If you suffer from tooth sensitivity, try cutting out acidic and sugary food and drinks from your diet as these can all trigger pain, as well as cause tooth decay. If you do decide to drink something that’s acidic make sure you use a straw, as this will keep the liquid away from your teeth. Speak to your dentist. Your Dental365 dentist will be able to give you specific tips to help with your sensitivity. Call 844-365-DENTAL to reach the Dental365 location nearest you.